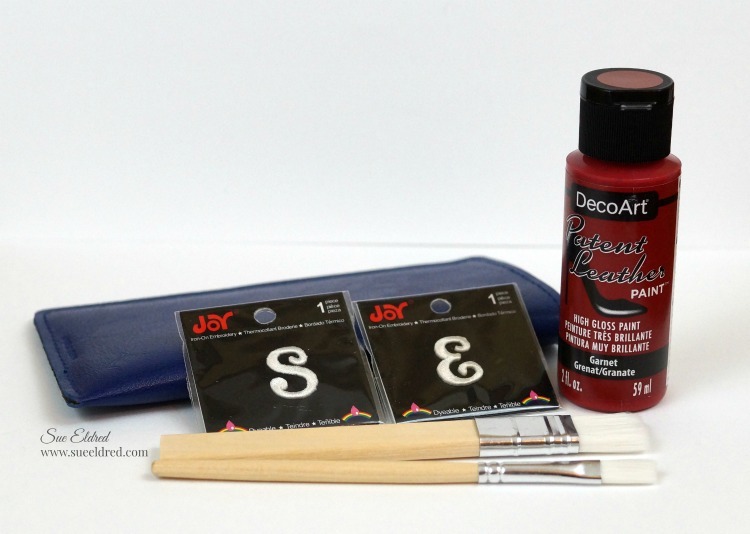 I picked up a couple plain canvas messenger bags for painting - because wearable art rocks! Working with acrylic inks and fabric paints, I started giving the front flap a little psychedelic color. 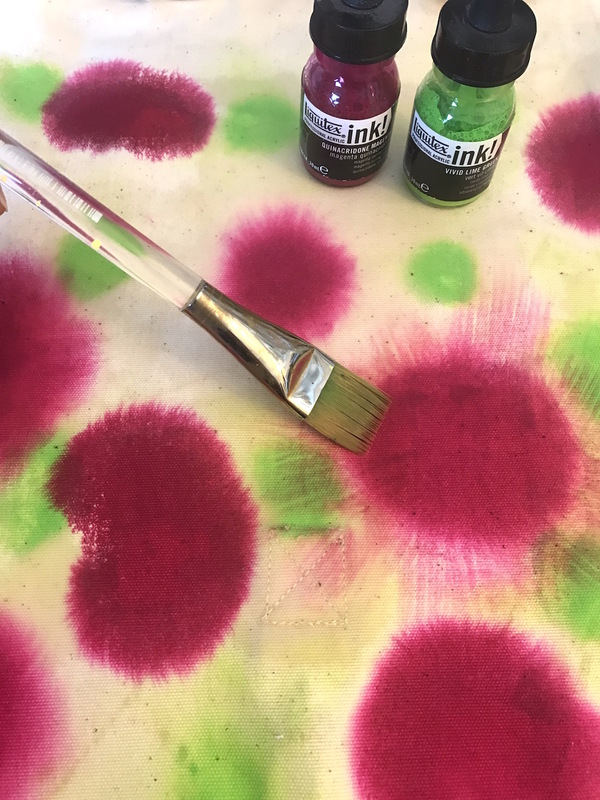 By misting the canvas first with water, I could get a nice "bleed" on all my drops of ink. In some areas, I brushed the edges out even further. After adding and blending a few colors to cover the flap, I let it sit for a couple hours until it was mostly dry, but still a bit damp. Then I randomly paint-stamped a few shapes all over and let it dry overnight. Because the fabric was slightly damp, I was able to stamp some faint "ghost" shapes with transparent fluid acrylic pink and yellow paints that absorbed more into the fabric. I used opaque paints for the green and blue shapes. 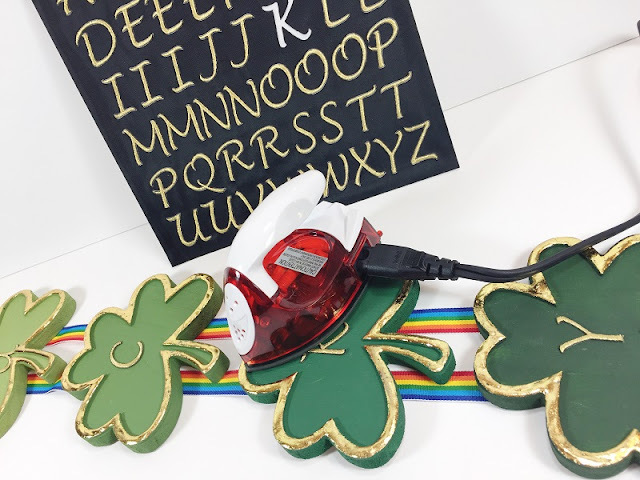 Once the flap was completely dry, I was able to iron on my letters to spell "flower power." Now I'm still trying to decide what color I want to paint the rest of the bag - I'm thinking black, so the bright colors on the flap really stand out. So fun! I picked up a free sunglass case at the thrift store the other day. I was looking for something to makeover with my new patent leather paints - I love the look of shiny patent leather. And... in red? Oh my! Combine fresh paint with embroidered letters from Joy and you have a custom, personalized gift that's quick and easy to make. 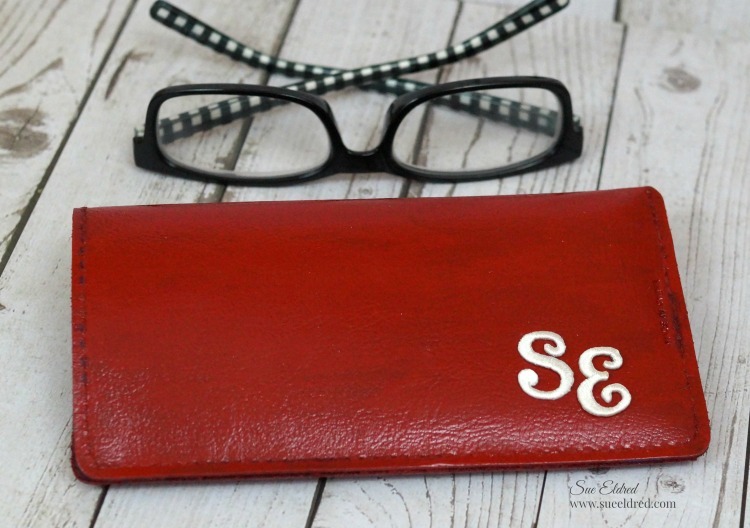 Apply two even coats of patent leather paint on the sunglass case with a soft bristle brush. The paint will have a tacky feel as it dries between coats. Glue your letters in place - done! 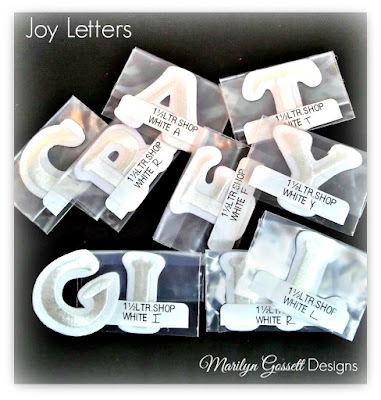 Joy iron-on embroidered letters are available at your local craft store in a variety of fonts, sizes and colors. 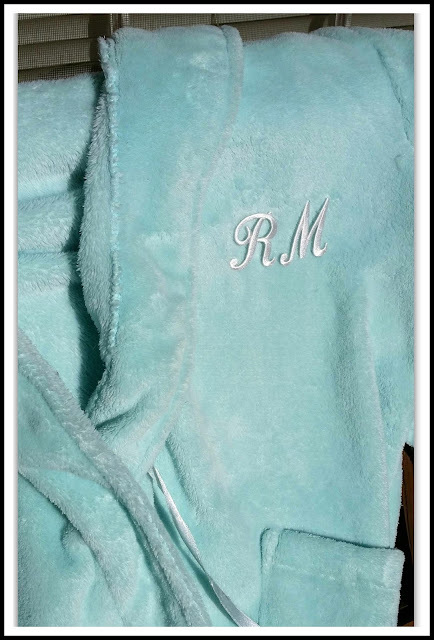 Spas and hotels always have lush monogrammed robes that feel so luxurious. But you can make your own for a fraction of the cost with Joy embroidered iron-on letters! I started with a plain fleece robe that I picked up at an after-Christmas sale for just a few dollars. 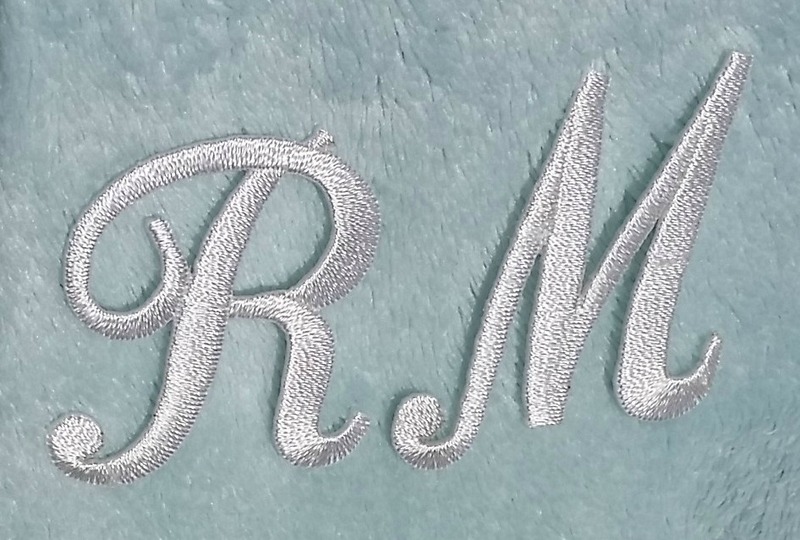 I then ironed-on two cursive style letters from Joy for my monogram. 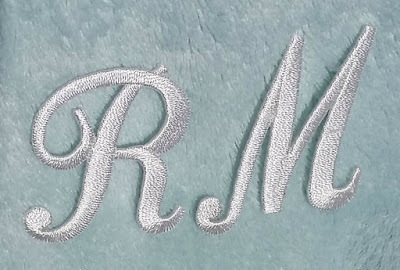 These letters are amazing because they give the look of expensive embroidery for a fraction of the price! So wrap yourself in luxury! This robe would also make a great addition to an expectant mom's "hospital go bag" or for bridesmaids' gifts! I really love vintage table cloths and as a result, I have a plethora of matching vintage napkins sitting around. 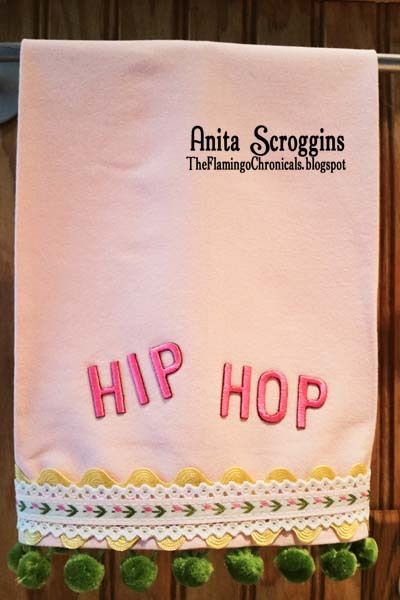 I am always looking for fun ways to update them - today I want to share a fun way to turn a vintage napkin into a cute hand towel for Easter. I started by layering my trims on one edge of the napkin. I used the Heat N Bond to secure the ribbons on top, trimming after they were ironed down. I turned the trimmed edges to the back of the napkin and sewed them down. I applied the Joy letters using the instructions with the packaging. In just a couple of minutes, you can change and personalize anything to suit your needs. Happy Easter! 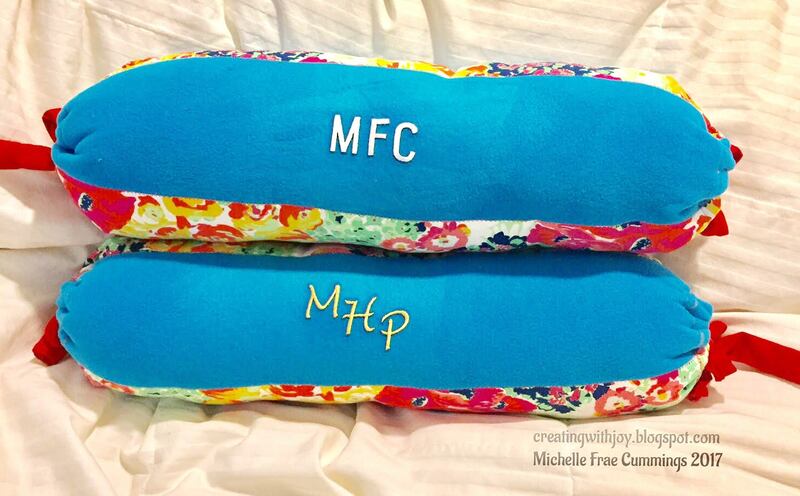 My mother recently requested a new neck roll pillow in bright cheery colors. While I was at it, I made one for myself as well. You can use them in the home or while traveling. Fabric of choice, 16 ½" x 25 ½"
1. 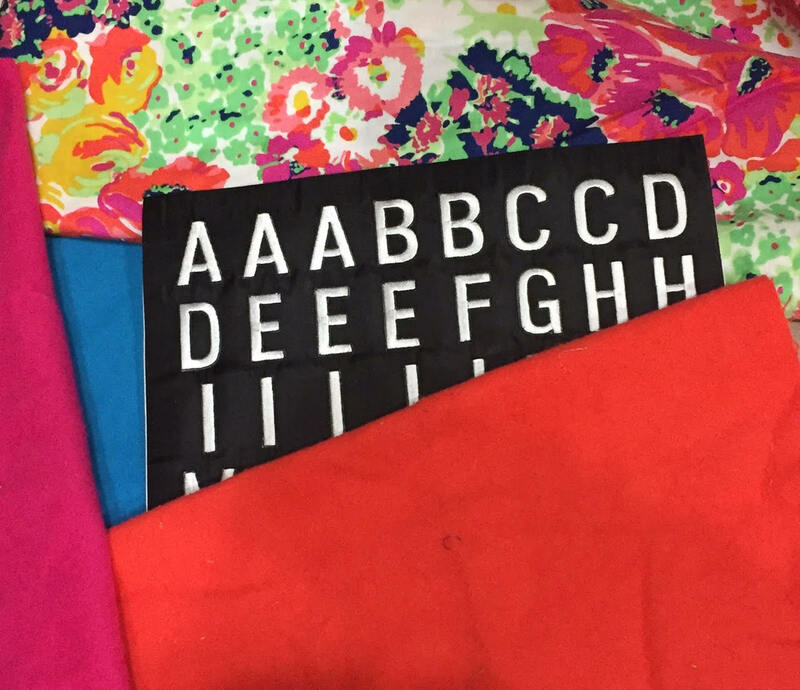 Place your Joy letters face-up on your prepared fabric. Place the parchment paper over the letters and press down with the iron twice in 5 second intervals. Let cool, then repeat the process without the parchment paper. 2. With the fabric wrong-side up and horizontal, fold the sides over by 1/2" and sew in place with the machine. This will make the channel for the ribbon ties. 3. 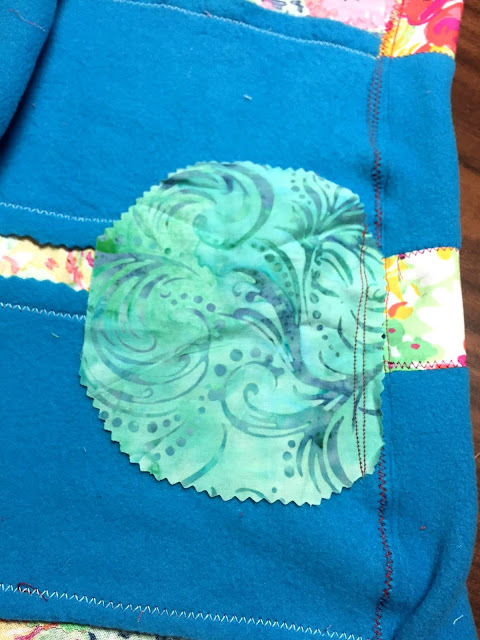 Place one of the circles in the center of the fabric along the stitched edge and sew in place as shown. 4. Fold your fabric with right sides touching. 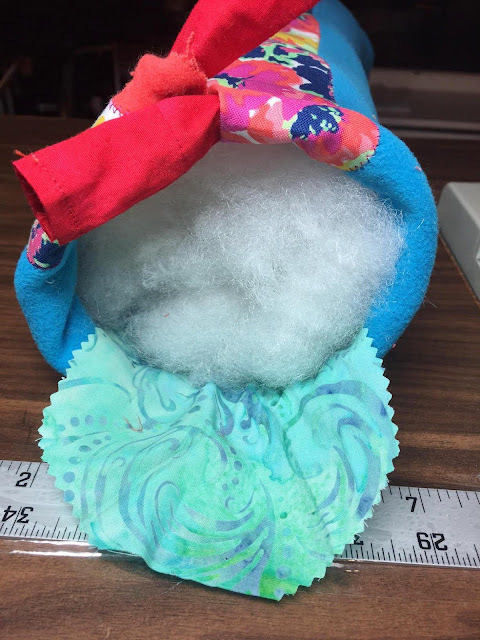 Pin in place if needed and begin sewing - careful not to close up the ribbon openings. 5. Attach the safety pin to the top of your ribbon. 6. 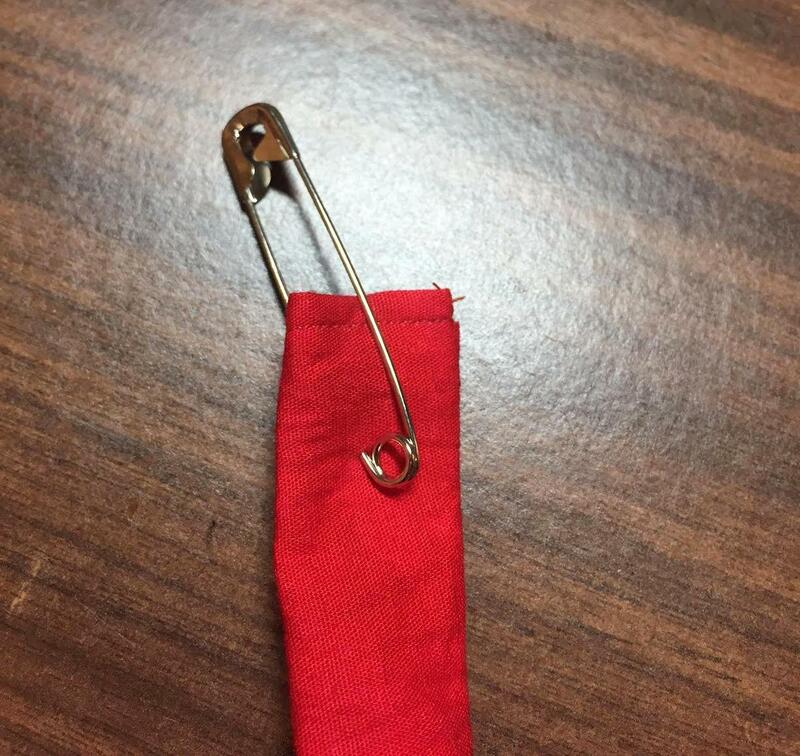 Push the safety pin with the ribbon attached through one of the openings as far as you can go. Feel through the fabric from here on in. 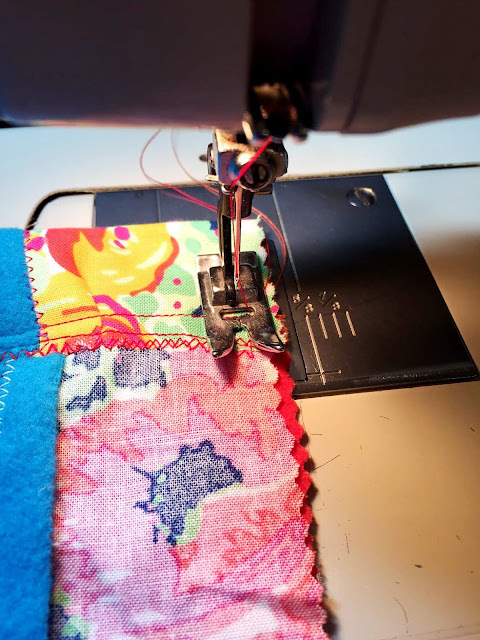 Pinch the back end of the safety pin and push more fabric over it from the front. Then, push another length of fabric over the safety pin, and so on. Until the safety pin emerges through the other side. Repeat process with 2nd ribbon on the other opening. 7. Fold your pillow, aligning the ribbon openings and make sure the ribbon ends are the same length. 8. 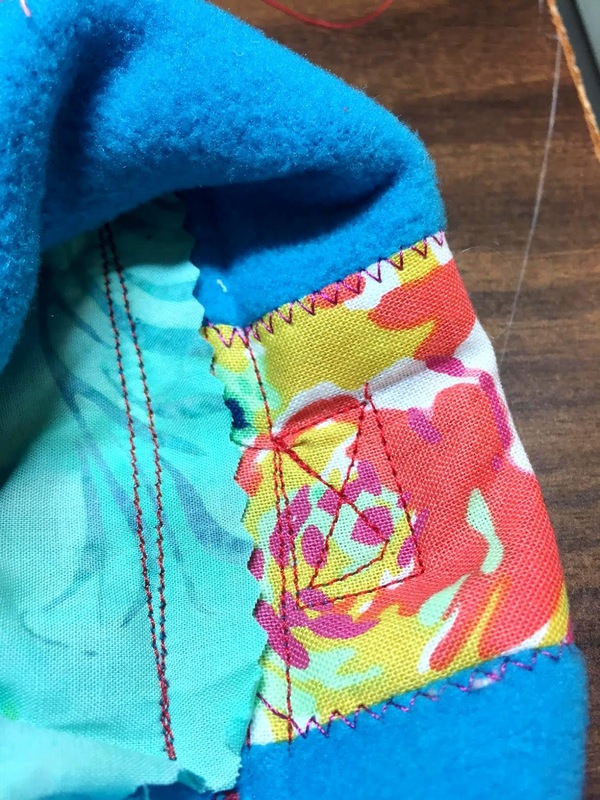 The center crease at the opposite of the ribbon openings is where you will need to add a box-stitch, on the inside of the pillow to hold in place the ribbon so it does not come loose when tying shut. 9. Fill pillow with desired amount of fluff. 10. Then push circle flap in and pull the ribbon tight before tying into a bow. Lay back and enjoy your pillow! 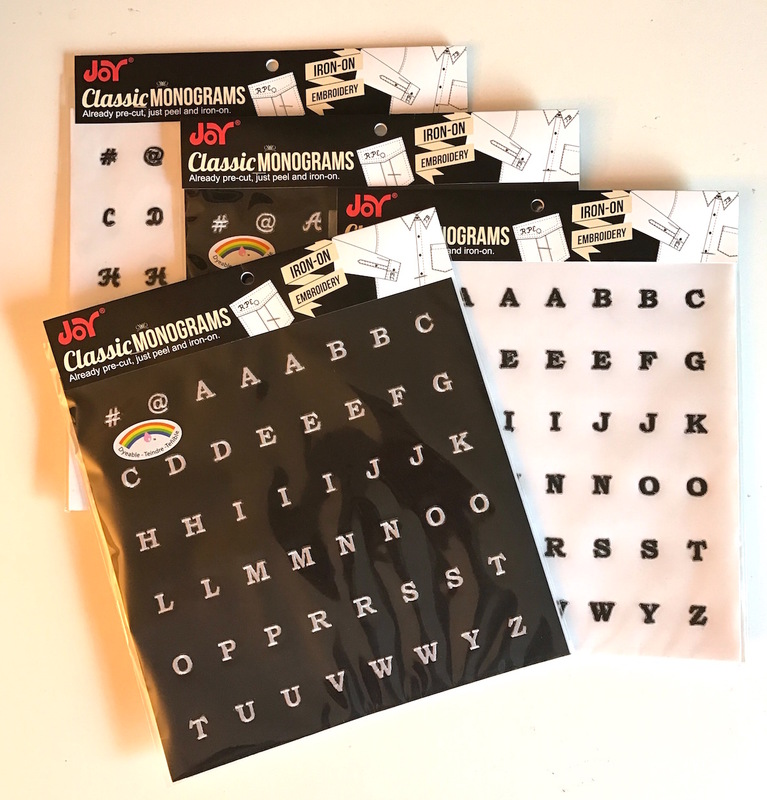 JOY Embroidered letters can be found at your local craft stores in a variety of sizes, colors, simple and decorative fonts. Visit our Facebook page for more inspiration! As part of our New Year resolutions (which we are actually sticking to! ), we're eating more fruits and vegetables and are being careful about washing them. I've noticed however, that some members of family aren't great about how they dry their fruit after washing it. They'll often grab a towel that's hanging up (that was used to wipe up counters, ICK! ), or a paper towel (a better health option, but not great for the environment). 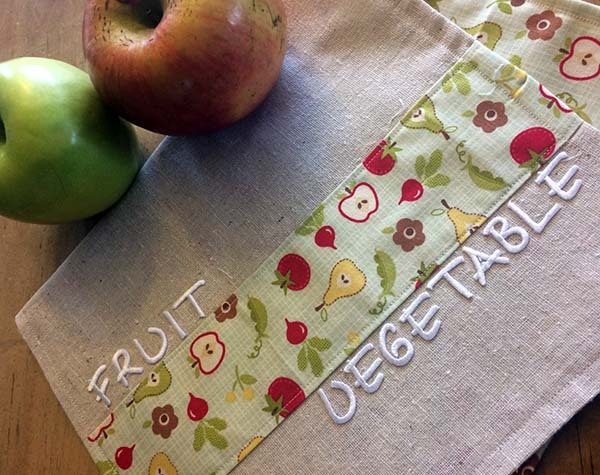 So I whipped up a few tea towels that are only to be used for drying our fruit & veggies AND labeled them, because I know how my family operates and that's the only way they will remember which towel to use. Place the letters onto the towel, carefully lay a pressing cloth over them, then press your hot iron down. It will take about 20 seconds for the letters to adhere. Allow the fabric to cool completely before you start moving it around. Remember: "Hot Forgets, Cool Sets." 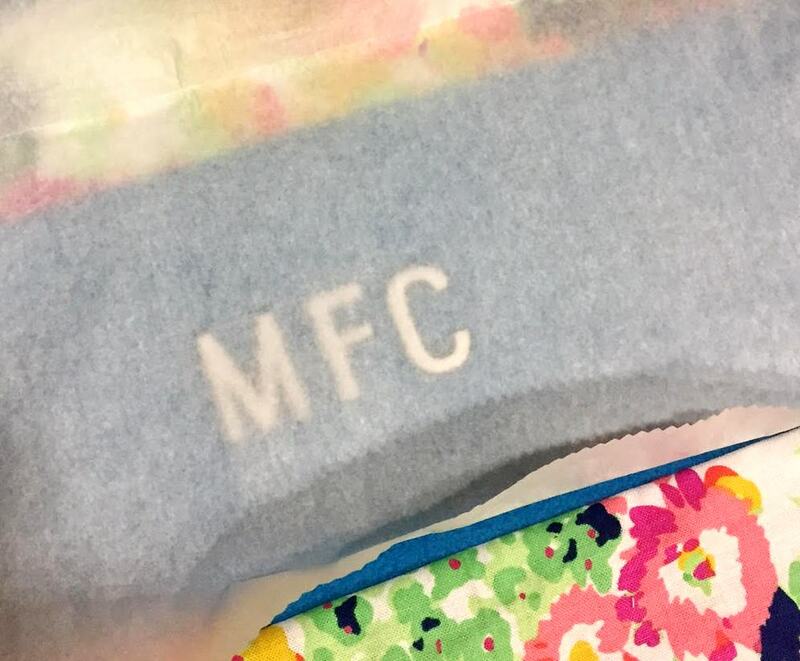 Flip the project over and press again (over where the letters are on the other side) to ensure that you have fully adhered the letters to your fabric. • 2 pieces of 18" x 10" solid fabric. This will allow for a 1/4" seam allowance. 1. I used a linen fabric for the front and a cute, cotton print for the back. 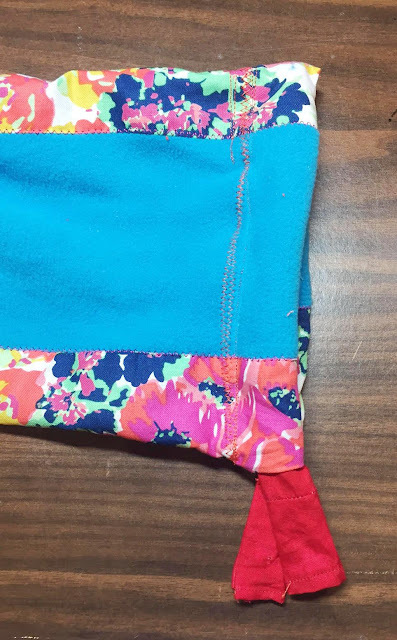 Fold the printed fabric strip lengthwise, folding each long side, one inch toward the middle. Press, then to stitch along the long edges. 2. Pin the print onto the solid piece of your towel, 3" above the bottom edge. Stitch into place. 3. Pin the top and back pieces, right sides facing, together. Stitch around the edge, leaving an inch or two at the top of the towel to turn it out. 4. Turn out the towel and press. Fold the opening in and pin in place. 5. 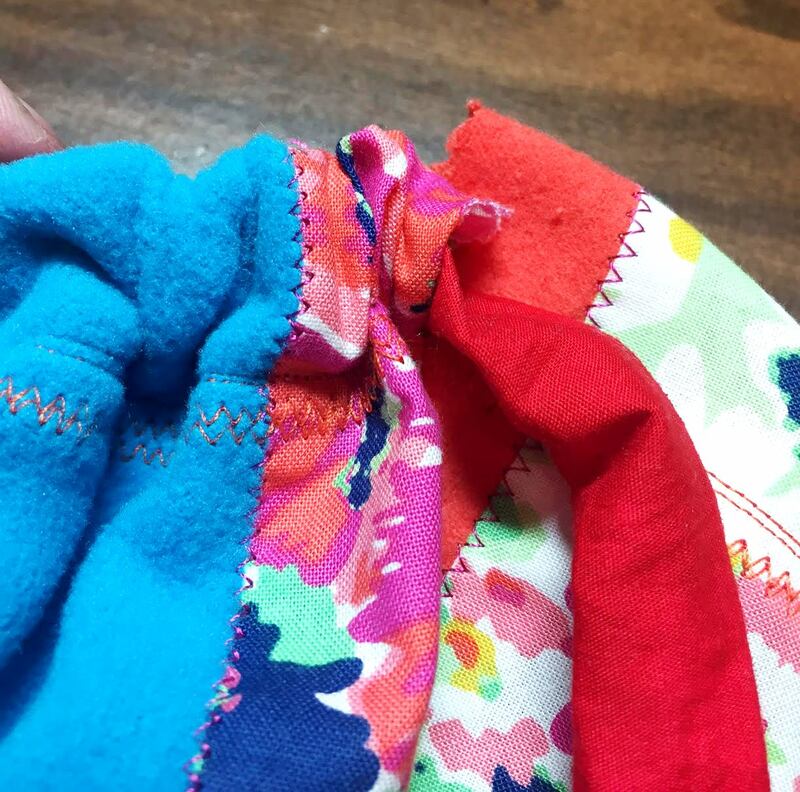 Top stitch around the edge of the towel, making sure to close the opening. 6. Place the letters, then follow the ironing instructions above. I hope you enjoy this tutorial. 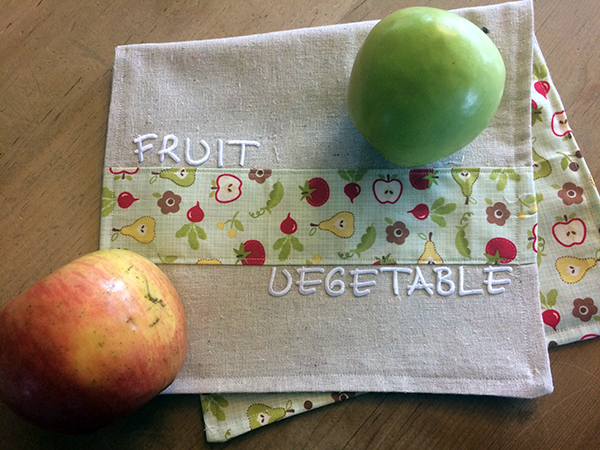 If you are in the mood to wash a few apples after making your lovely towel, pop over to Laura's blog for a delicious Sauteed Apple Recipe! 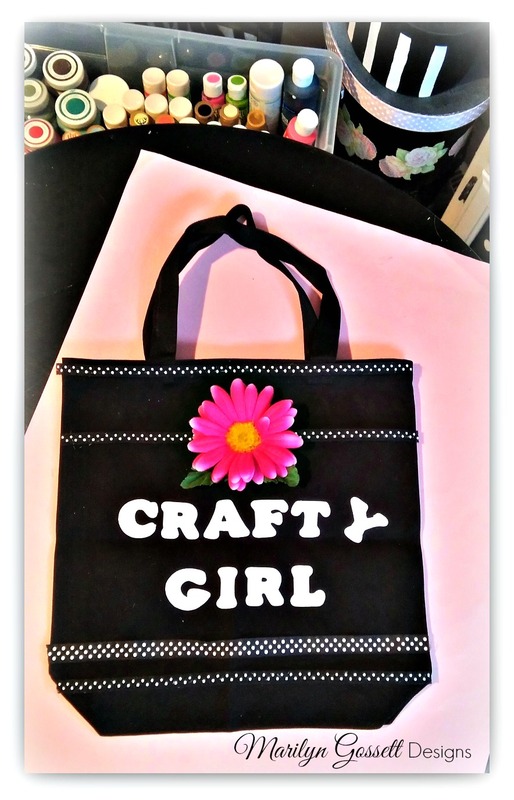 What brings more joy than a bag full of creative supplies for that special crafty girl? Not much, in my opinion. 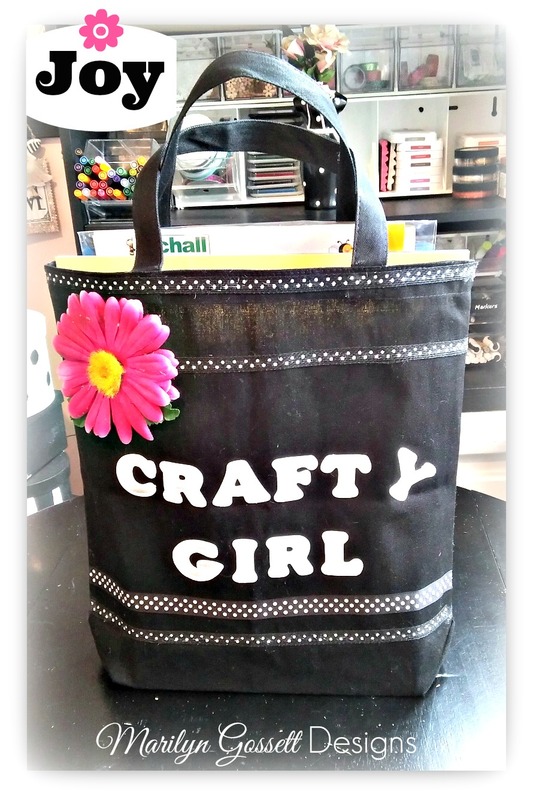 Find out how to make your own tote here! 1. 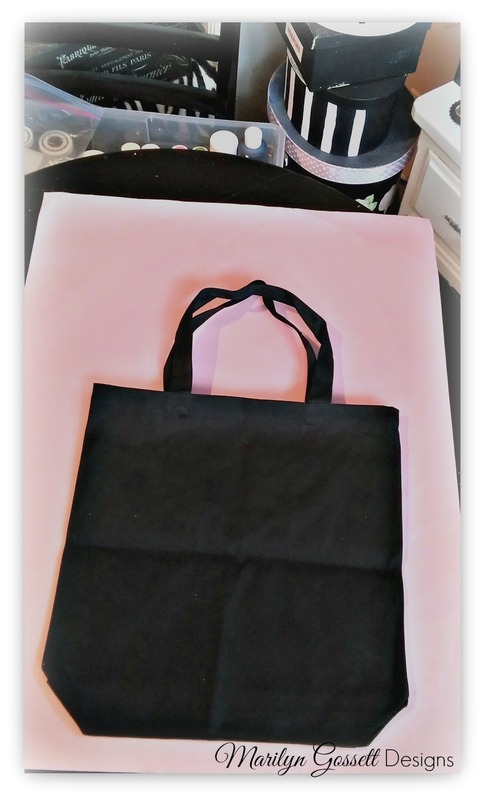 Lay the tote bag flat and iron out the store folds. 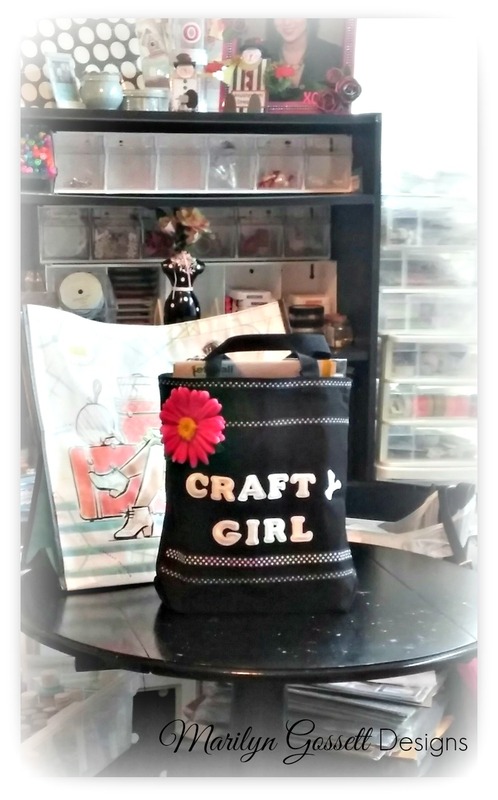 Measure the ribbons across the front of the bag, cut to desired length and glue in place as shown with fabric adhesive. 2. Position the letters on the front of the bag. 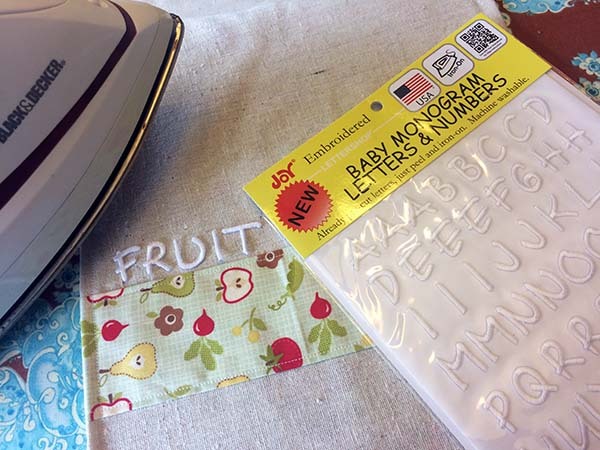 Cover the letters with a tea towel and press with a hot iron until they are permanently adhered. 3. Adhere the flower with a glue gun - glue the petals down too, if they are too floppy. 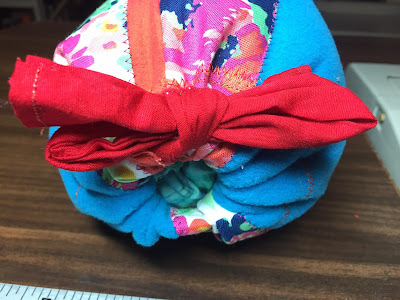 The flower can be positioned in a number of ways - I chose to place it on one side instead of the center so it wouldn't get in the way under your arm if you wear the bag over your shoulder. 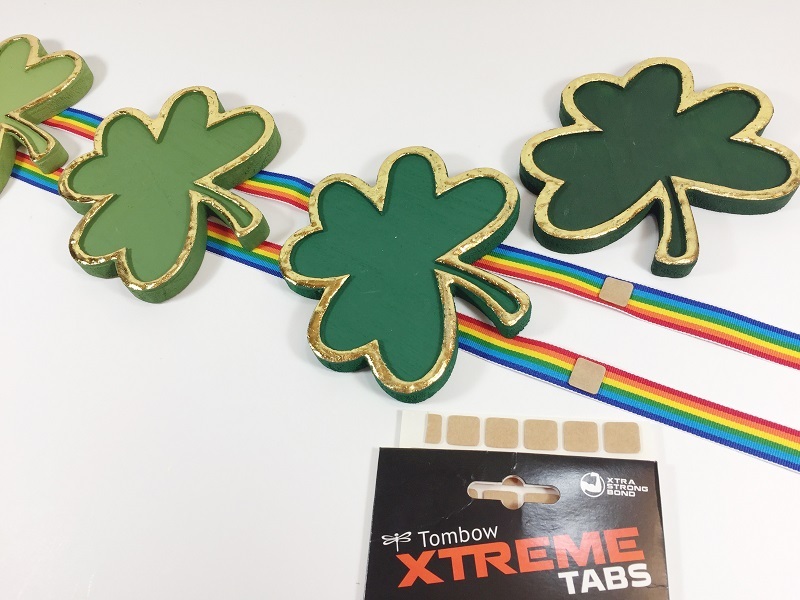 The day of the leprechaun is just around the corner and you can make this quick and easy banner for St. Patrick's Day in just under an hour. Maybe it will bring me some LUCK this year! 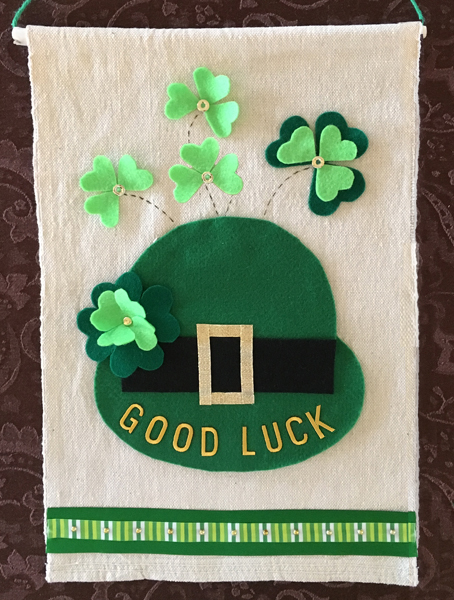 I hope this lucky shamrock banner inspires you to create some St. Patrick's Day themed home decor items. 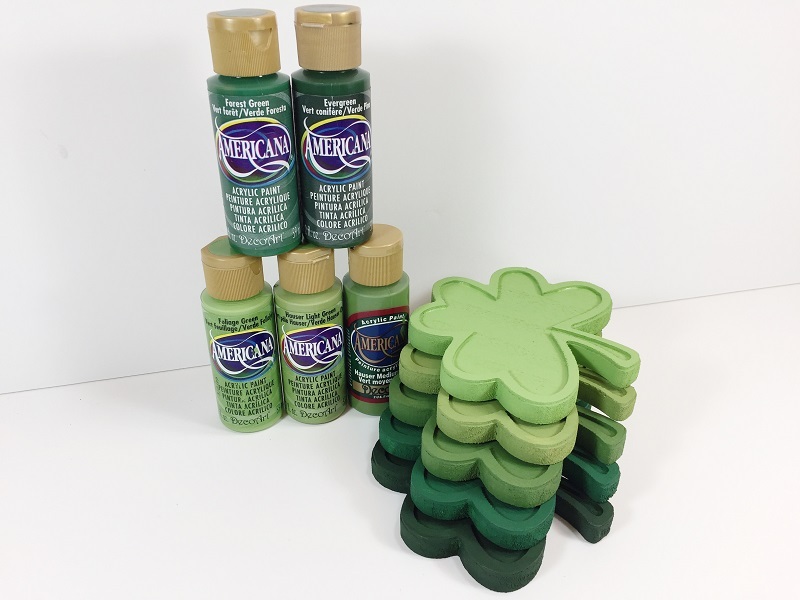 Paint five wooden shamrock shapes in five different shades of green craft paint. Let dry, then apply a second coat, if necessary. 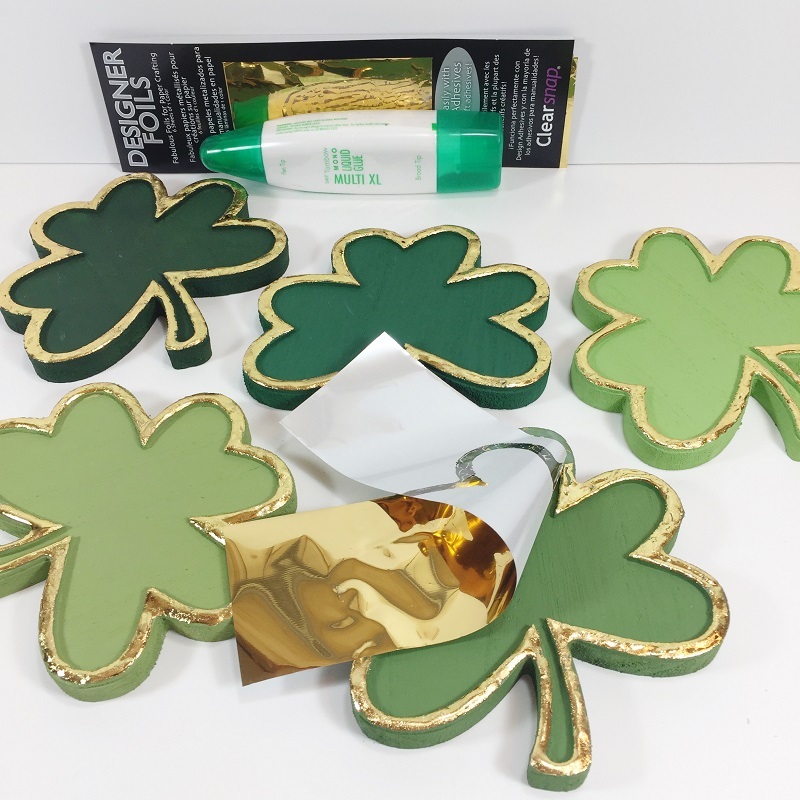 Apply liquid glue to the edges of each shamrock. This glue applies white, but dries clear and tacky. I always let it set up overnight. Once the glue is dry and clear, apply release-foil by pressing and burnishing gently with your fingers, then peel back. Repeat until all the edges are covered. Attach shamrocks to rainbow ribbon with clear adhesive tabs. I chose to hang my shamrocks in an ombre fashion from lightest to darkest, but any combination of greens would work! Use an extra long, single length of ribbon with an arch at the top to resemble an actual rainbow. I love the shimmering gold thread that these JOY embroidered letters are made from. 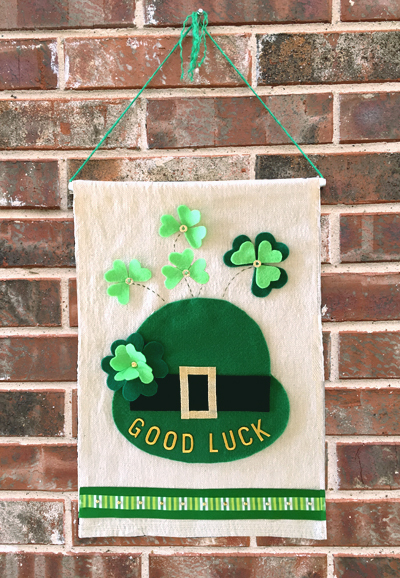 They really give any project extra sparkle and are perfect for this St. Patrick's Day wallhanging! Select letters to spell LUCKY and position on shamrocks. The letters just pop right off the sheets that they come packaged on and the iron-on adhesive is already on the back, which makes any kind of personalized project quick and easy! Iron on the letters following the directions on the back of the package. 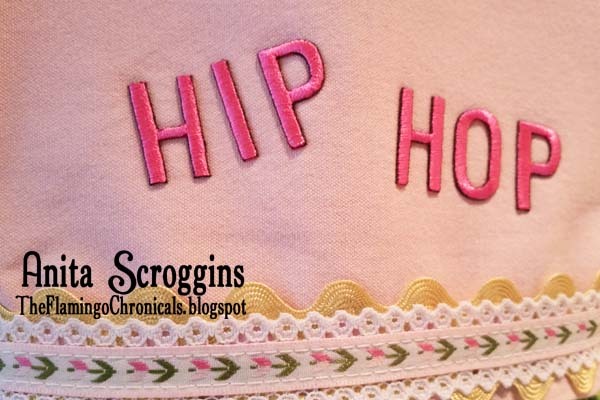 I use a small craft iron because it allows me to get into small areas and doesn't have any steam holes, which can sometimes cause an uneven application of the embroidered letters. It's almost St. Patrick's day, the day to raise a glass, tuck into a meal of corned beef and celebrate! 1. 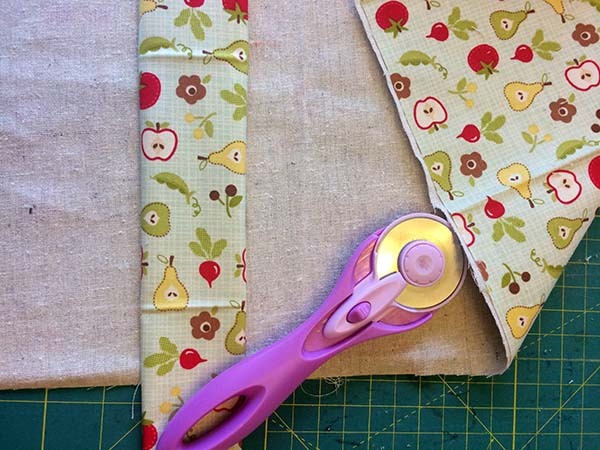 Cut canvas fabric to size. Note: I use a canvas drop cloth from the hardware store. It is inexpensive and the perfect weight for decorative banners and garlands. 2. 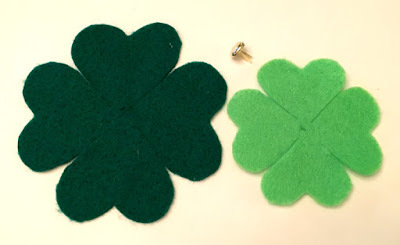 Use the patterns as guides to cut the shape of the hat from medium green felt, 3 light green shamrocks, 2 dark green shamrocks and a 7" x 1.75" rectangle of black felt. Glue the black felt to the hat. 3. To create the shamrock for the hat, cut along the lines as indicated then place the small shamrock on top of the large one. Poke a hole through the center hold together with the brad. 4. Create a buckle for the hat band with the gold ribbon. Cut two, 2" pieces and two 1.5" pieces. Glue in the shape of a rectangle at the center of the black hat band. 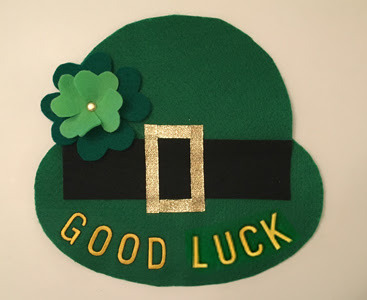 Iron the letters on the brim of the hat then glue the shamrock in place. 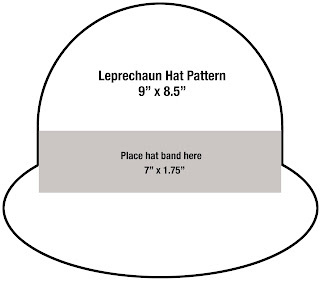 Glue the hat to the banner. 5. 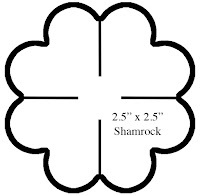 Create additional shamrocks using the same patterns. Cut the shapes, then cut all the way through the center on the cut lines to create 4 hearts. 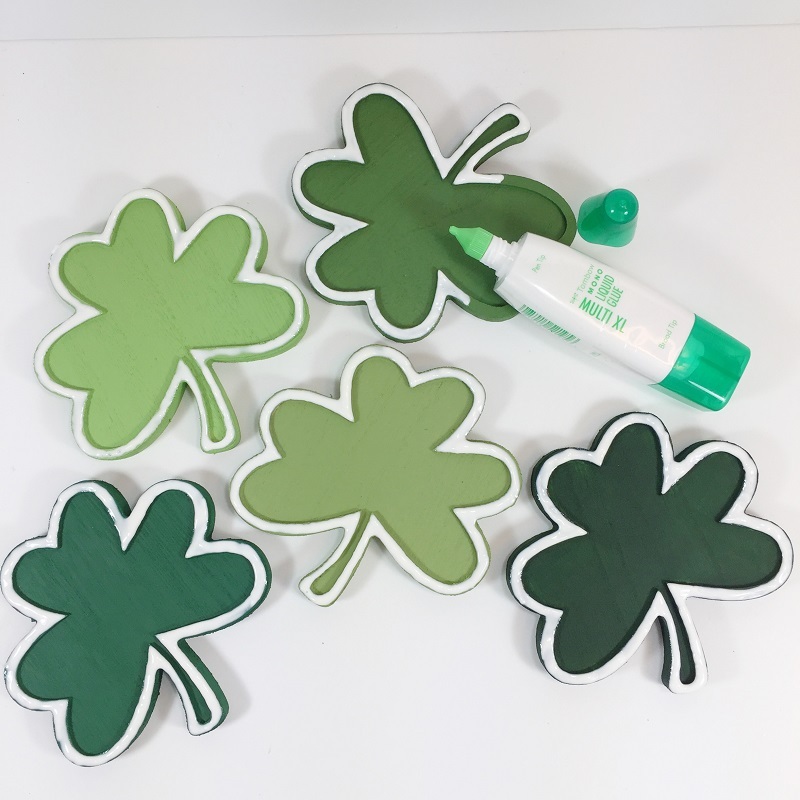 Create the additional shamrocks by gluing 3 hearts together at the base. 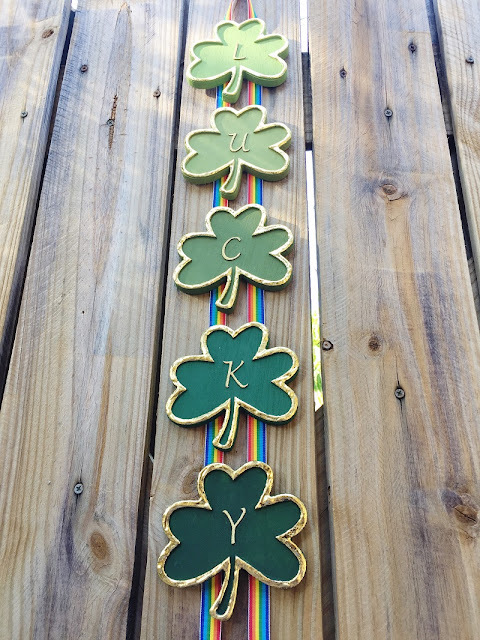 Glue to the banner then add a gold metal embellishment to the base of each one. 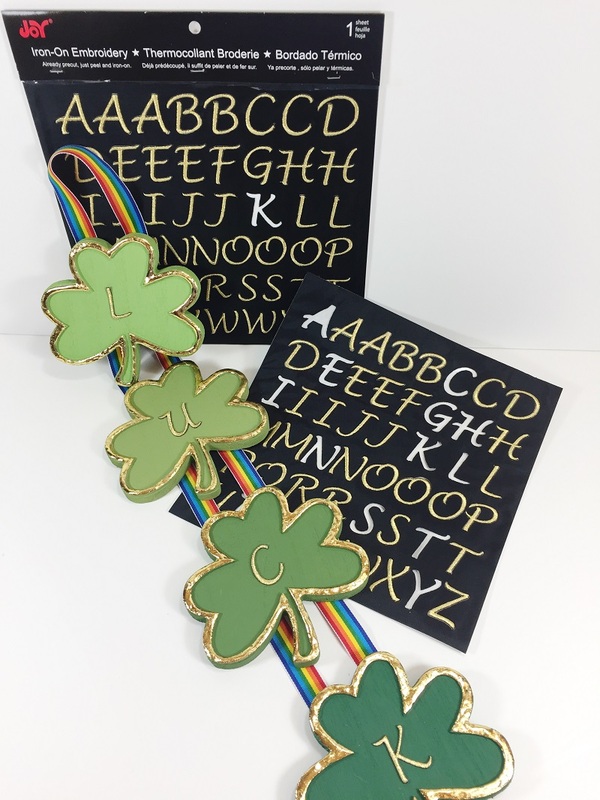 Draw stitch lines from the shamrock with a black marker. 6. 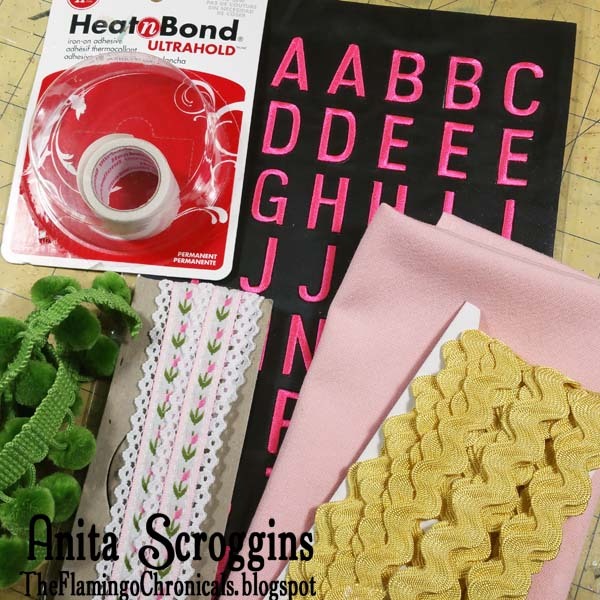 Create a border with 12" pieces of ribbon. 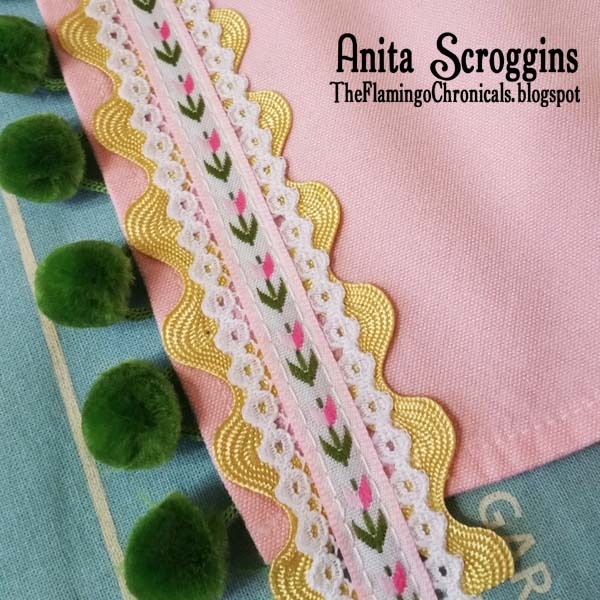 A narrower decorative ribbon was glued on top of a wider 12" piece of ribbon then embellished with gold, nail head stickers. Glue to the banner about 2" from the bottom. 7. Fold 2" over at the top of the canvas then glue to create a casement for the dowel, or cardboard tube. Tie the ends of the jute to each end of the dowel to create a hangar or, if using a cardboard tube, thread the jute through the center then tie the ends together at the top. You can find Joy embroidered, iron-on letters at your local craft store. 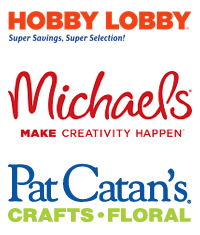 They are available in a variety of colors, sizes and fonts for all your home dec and crafting projects. My granddaughter is starting to count and sing her ABC’s, so I thought she would have fun with a felt bulletin board. The JOY iron-on letters and numbers are a perfect addition. Apply glue or tape to the board and cover with the felt. If you are using glue, spread it out in a thin layer. Cover the edges of the board with the tape. Cut felt shapes with a die-cutter or scissors. Simple shapes like flowers, squares, circles and triangles work well. Iron on the letters and numbers to the felt following the manufacturer’s instructions. Press the shapes onto the board - the felt will naturally stick to itself - and have fun!